Spring is finally making an appearance and it is, without a doubt, the year to be sweet and kind yourself. We are in a world that gives us Instagram models and celebrities to compare ourselves to, however, 2019 is the year to reclaim your inner beauty by treating yourself to the luxurious experience of a full body beautification at The Studio Salon, Spa and Boutique, just off of Winchester Ave. in Martinsburg, WV. . While it is easy to say that beauty comes from within, it seems like something less tangible in person, however, spend a day with the girls at The Studio and you will radiate from within and every inch of you will be covered in the tranquil confidence that you can be yourself and look fabulous doing so. The Studio is a chic, unique and ever evolving salon, spa and boutique that gives their clientele the experience of the best technical work, the most modern services and the ultimate in self-care professionalism. Each individual hairdresser, nail technician, esthetician and massage therapist (Equipped with the best brands) are talented artists with the education and creativity to have you looking and feeling beautiful as well as refreshed and ready to take on the world. While watching customers in their individual chairs, speaking to their technician, you can see and feel the confidence radiating around the room. From the moment I stepped foot into The Studio Salon, Spa and Boutique, even I couldn’t deny the urge to be pampered and showered with beautifying attention. 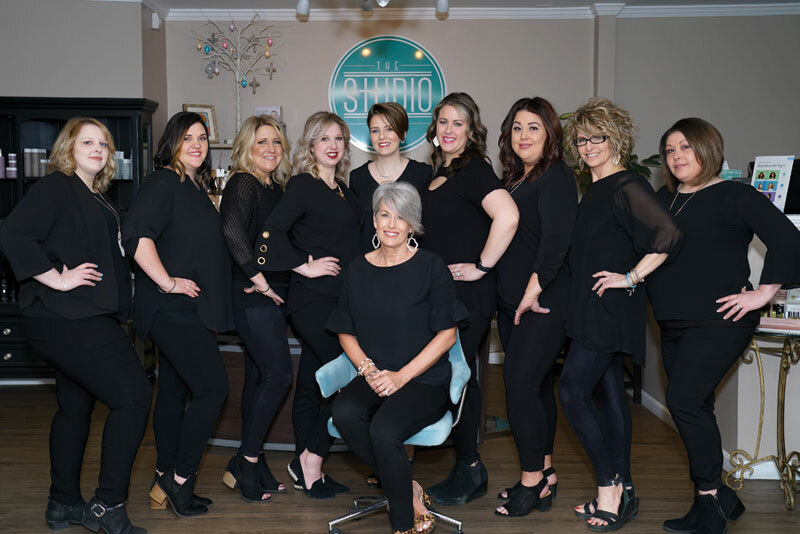 Stacey McFarland, gorgeous owner of The Studio Salon, Spa and Boutique, just recently stepped away from her own chair after 32 years of mastering dedication to her craft of hair care. It is that very passion and love for what she achieved that inspired her to open this hidden gem that feels as though you have been transported into the most modern of salons in a world that is filled with all of the major brands and services to suite any and all tastes. Stacey is a breath of fresh air in this industry as she is forward thinking, modern and maintains staying very relevant in an ever-evolving business. While speaking, it is apparent that her main goal is the encouragement, lifting up, and support of our fellow women as she exudes an enigmatic personality that is both magnetic and charming. With the motto to “Breath love, hope and encouragement”, it is easy to feel relaxed immediately in the tranquil décor, laden with inspirational quotes as well as the most beautiful contemporary furniture, including displays of Jag Jeans, Peepers (Bifocal) Sunglasses and Living Proof hair care products. The overall esthetic is very modern chic and it is undeniably an effortless taste for femininity and iconic styles. All of these amazing fashion choices and jewelry options are living in a sea of gentle beige walls, floor to ceiling mirrors that give the space an enormous and open feel as well as gentle, natural lighting, that truly is as though you have stepped into an advertisement for a New York City’s finest salon, spa and boutique, fit for royalty. Stacy is dedicated to empowering women from all walks of life and ensuring they have a sanctuary of beauty to call their own. The Studio Salon, Spa and Boutique has been open since 2013, and each year an event graces their stage and this year is no exception. This year was dedicated to Girls Night Out; a fashion show and shopping event, dedicated to enjoying an evening of shopping new fashions that are modeled for you, by women just like you, along with delicious food and hourly drawings for prizes. Stacey loves making women look fabulous as well as feel beautiful in their own, unique, skin. What makes local events like hers so special is that you get to physically interact with the staff, brands and community. Getting to see women in our community light up the stage, wearing fashion trends that you can buy on the spot, feels more like something from New York Fashion Week and is awe inspiring for future events happening. We are currently in an age of technology and beauty is not immune to the influence of social media and Internet inspirations. Never before have we had so much access to everyone else’s personal and individual styles; With the world at our fingertips, Stacey dives right into posting daily to their Facebook page as well as allowing us all to step into The Studio with her by going Live and updating us on all the newest brands, services and events happening. With an ever-evolving world of beauty trends, it helps to have all of your questions answered in real-time, every Wednesday afternoon. Stacey enthusiastically provides fashion advice on a plethora of topics, (such as fashion styling ideas) insight into the newest inventory updates, as well as information on their trips to Las Vegas that they attend in order to go directly to all of their product suppliers face-to-face at Market. This trip, twice a year, ensures that The Studio will always have the newest and very best brands in hair care as well as up to date fashion. There is a lot of dedication involved in vetting out each individual product that she decides to provide to our specific demographic, as she is tailoring all of the services and brands offered to what we love here in the Eastern Panhandle. Living Proof Hair Products is one of these incredible brands that Stacey and her stylists live by. As someone with an extremely difficult hair type, I can say that it is important to have a brand that you can rely on and Living Proof is one of those brands. It is an incredible group of founders that include not only hair stylists but also scientists in order to provide over 50 hair care products that have won more than 150 awards. The products are free of silicones, parabens, phthalates, and other unsavory chemicals, all of which is quite important to the lifespan and quality of your hair. If that weren’t enough to have me on board, the products are full of real-life science that is safer, smarter and more effective for all hair types. Since day one, harmful ingredients have never had a place in any of the trusted hair care lines. Living Proof founders recruited scientists from outside of the beauty industry, along with leaders in cancer research and restorative surgery to discover, prepare and test every product. Living proof hold themselves to a higher standard of analysis for everything that comes out of their labs, not because it’s trendy or easy, but because using science to create safer, smarter, more effective choices for your hair care regimen is the right thing to do. Stacey at The Studio Salon parallels products, stylists and ethics, making it an easy choice to make for the sake of your hair. Not only will your hair be deeply cared for, but also there are a plethora of other services such as a nail technician that is skilled in the latest methods like Gel manicures (a few different brands as it preserves the natural nail), an Aesthetician that provides incredible facials as well as eyelash extensions, and a massage therapist that can turn your spine into Jell-O in less than an hour. We are constantly bombarded with the stresses of everyday life and stepping into The Studio Salon, Spa and Boutique is like a beauty time capsule because you can step in feeling the weight of the world, and step out feeling lighter than air and ready to take on your world. In order to keep up with all of the events, newest brands and services at The Studio Salon, Spa and Boutique, be sure to check out their Facebook page at www.facebook.com/studiosalon.spa.boutique.